How can you keep yourself at the top of your prospects’ and clients’ minds? LinkedIn is a powerful tool that can help you do just that, but only if you know how to use it. Unfortunately, LinkedIn can also be confusing and changeable, and even if you have a LinkedIn profile, you may not know how to leverage it to get the most out of it. Today’s guest is Viveka von Rosen. Viveka is an author, speaker, and LinkedIn expert. She’s also a CVO & Co-founder of Vangreso, a digital sales solution provider that works with people to help create their personal brand online and create content for sales. Listen to the episode to learn more about what Vangreso has to offer, as well as what Viveka has to say about the benefits of LinkedIn, the challenges of using LinkedIn more effectively, and what you should do to turn your LinkedIn profile into a useful resource. Marylou: Hi everybody, it’s Marylou Tyler, and this week’s guest is Viveka von Rosen. She is the foremost authority, in my humble opinion, on LinkedIn, all things LinkedIn and really all things social selling and it’s such a mystical thing for people like me who are targeted, direct, list-based, to have someone come along and actually be able to replicate what I do, but in the social world. I’m going to let her introduce the company that she works with and how they came together, because it’s a great story, but I’ll totally screw it up if I say. Without further ado, Viveka, welcome to the podcast. Viveka: Thank you so much. I said you can call me an authority, but thank you for almost calling me the––I’m thrilled to be here. This is what I love about this whole social community, recently, four of my competitors and I got together and decided to form a new company which is called Vengreso. I’m one of the cool founders obviously of Vengreso. We’re really a digital sales solution provider. What we mean by that or other people call it social selling, but we really want to work with people as far as creating their personal brand online, as far as creating that content for sales so that we keep in touch, or that our clients keep in touch and keep on top of mind with their audience, and with their prospects. The whole social selling piece that comes along with that as far as lead generation, and using some of the tools out there of which I am a ginormous fan of LinkedIn despite its ups and downs, and its purchases, and its changes, which seem to happen every time I release something big and new, a book, or a program, LinkedIn decides to change. Nonetheless, it’s still I think especially in the B2B world, one of the most powerful tools that we can use for the things I just mentioned; for that personal branding, for lead generation, and for content marketing, and engagement, and creating that top of mind awareness all coming back to building that know, like, and trust factor, all things being equal, people do business with people they know, like, and trust. It’s just another tool in the long run. That was a really long run-on sentence there. Get it all in one sentence and don’t breathe. Marylou: My experience with LinkedIn is a double-edged sword really in a lot of ways because I’m used to the mechanization of targeted outreach. When I get over to LinkedIn, I’m like fumble fingers. I don’t know where to begin to how to do whatever I need to do. I know you’re going to laugh at my story but I had a very small workshop that I did in Des Moine, Iowa and I do it every year as a thank you to the city and also to update my headshots because my hair is getting grayer, and grayer as I get into the 60 range of age. Viveka: Yeah, we’re going to put you in LinkedIn jail. Marylou: That scared me, I think started the marketing process, the campaign, 30 emails a day over the course of five business days, I sent a whopping 150 emails, which I could have done Control C, Control V.
There is almost an off putting nature to LinkedIn, so when I hear you say, build your top of mind, your know, like, and trust, how the heck do you do that with LinkedIn? Where do you begin with dummies like me, a dummy 101 course or something. How does that work? What they don’t tell you is that they’re using third party apps and that that’ll probably get your LinkedIn profile if not shut down, definitely like you said, you’ll get the warning letter, you’ll get thrown in jail. Ironically you said, “I could have done copy paste.” I’ve got an assistant and I used to love all of those tools because it was, it was kind of one touch shopping. LinkedIn is very much against third party apps and so I had my assistant go in and copy paste, and LinkedIn still restricted my account, and that was just with my assistant doing it manually. They’re very touchy about that right now. Here’s the thing, it’s funny because LinkedIn is so unclear in people’s minds as to what the purpose of it is. A lot of people especially in the B2B space, especially executives, still think of it just as an online resume, and maybe a recruitment tool. They might have their profile that they popped up there in 2007 and haven’t looked at since, and an inbox full of messages and leads that they don’t even know about because they’ve got this perception or someone in their company told them back in 2007, “You have to be on LinkedIn.” They’re like, “Okay, I will.” And that was that. To the extreme of people out there going, “You can contact anyone you want to in the whole entire world on LinkedIn,” which in some ways is true but it’s not as easy as all that, or we’d all be using it. You get these third party tools that are on the outside seem very powerful as far as lead generation, but realistically not so much, and then you get LinkedIn’s paid accounts, a Sales Navigator, I’m a fan of. Marylou: I give you permission. I’ll wave a magic wand over your head to give you permission just to be unpleasantly persistent. Viveka: Here’s some ads, go spend a bunch of money without any kind of decent targeting and tell the world that they don’t work. They’re great tools, but it is, it’s fire to a baby, and people don’t know how to use it, and so LinkedIn gets a bad rep, plus they change things, you get really accustomed to a feature and then they’re like, “Yeah, we’re going to take that away now.” That’s the frustrating part of it. However, that being said, and back to my original statement of what we do, who we are, and who we serve. For the B2B world, LinkedIn can be really powerful. For an executive, for a sales professional, for a marketing professional, for a business owner, as I first mentioned, being able to establish your brand within your company. If you work for Oracle, who are you within Oracle? If you work for your own little company, how do you separate it out so you look like you’re more than a solopreneur, or if you’re head of marketing, how do you use LinkedIn to help promote the thought leaders and industry leaders within your companies, or within your client’s companies. It’s a really powerful tool, it doesn’t take nearly the time that it takes to develop a website, and I’m not saying either or, certainly not saying either or but most definitely for sales leaders within larger enterprise sized companies, how do you differentiate yourself? The fact is, people are Googling you. The modern buyer is most definitely researching you and that’s a big mistake that we make, we have all these tools and we don’t even research our prospects, but they’re researching you, and if you show up on LinkedIn or you don’t show up, if you show up with “a barely there profile,” it can actually cost you and the company credibility, or if you don’t show up at all, in this day and age is like, “Is this person even real?” How can you be a sales professional and not have a profile on LinkedIn, or you’re hard to find because you don’t know how to optimize your profile in the right way. It’s a real miss and so having that strong personal brand is I think very foundational to success on LinkedIn, but then on top of that, yes, you actually can find connect and engage with almost anybody. You just have to do it the right way, and you have to look at LinkedIn, and I’m sure you’ve all heard this before, but you have to look it LinkedIn like you would any kind of networking event, hopefully, you’re not going to walk into a networking event, a chamber event, a conference, a trade show, with a handful of business cards going, “Buy my stuff.” Yet that’s how most people on LinkedIn interact. “Hi, you don’t know me, I’d like to connect so I could sell you my stuff and put you on my mailing list without your permission.” That’s not the way to do it. Marylou: No, and I think the other thing, too, is, there is this mystique around the—I’ve seen a lot of posts that some of the executives that are connected with me are constantly complaining that LinkedIn is not Facebook, and a lot of times, people are creating an environment within LinkedIn that’s not professional enough. There are some unwritten rules. Using this service, you kind of get a gist and using your common sense. There is a mystique around how to get the most out of it for both you and your clients. How to be able to create an environment that allows them to watch you, look at you, read about you, understand who you are without being too pushy. This is where I have a disconnect because the targeted outreach is all about being patiently, pleasantly persistent. Persistent is the word. In LinkedIn, this is my interpretation, you could always just stomp over it. LinkedIn is like this sort of attraction, it’s like a big dating game where you throw a little bit out there and let them have a little bit more about you. A taste, kind of reel them in, get your little fishing rod out there, you give them a little bit more until they finally say, “Okay, I give. What have you got? The other thing I learned, too, is that, in targeted outreach again, we don’t put a lot of links in our emails, but it’s not really permission based, it can be, I shouldn’t say that, I’m going to talk both sides of my mouth on this one. It could be help, ask, or you could just ask right up front and then help. LinkedIn though is really permission based, is it not? Can you get direct on there? Viveka: You can get direct with it but it depends very much of who you are and what your industry is. I’ve got a client and he’s really well-known in his industry and he has a very unique offer, and so yeah, he can pretty much go out say, “Hey, you need me and here you go.” People are all over it because they need him, and they know who he is, and there you go. In most cases, it really is about educating your audience, but the persistence and the consistency thing is very important. The problem is, I’m somewhat guilty of this myself, the problem is you find a new toy on LinkedIn, maybe it’s LinkedIn video, maybe it’s LinkedIn long form posts, maybe it’s LinkedIn publisher, when you find this new toy, you’re all over it, you build expectation, you start to get followers and then you get distracted by a different shiny objects, maybe on Instagram. It is harder to be consistent using LinkedIn unless you really do have a strategy in place and quite frankly you either use a tool, an approved third party tool, or put it in your calendar, I have to go do this today. In most cases 90% of the time, it is about creating that helpful, useful persona about making your profile a resource, and making your content a resource as opposed to the hard sell. As you mentioned with the links, it’s interesting, LinkedIn, even though it’s in their name, LinkedIn like Facebook, like Twitter is starting to limit visibility on updates that have links in them. It’s a little bit frustrating because you can get a lot of visibility, I think it was our friend, Alice who did the question about shoes, anyway. It was business related, hundreds and hundreds of comments and reactions, no links in there, and that’s great for building top of mind awareness, but it’s not exactly driving business to a website. Where do you measure? Do you create that top of mind awareness and then you follow up with either an ad or a private message? Once you’ve built that know, like, and trust factor, people are more likely to click on and click through, or do you try to game the system and get a link in there, maybe in the comments section. How do you balance that and how do you utilize LinkedIn? General rule of thumb is as you mentioned, it’s a dance, and it’s about offering a little bit of cool information and getting people to come to you, and the fishing because you’ve got to have the right bait on your fishing rod, it’s not just about finding the right pool and throwing your line in the water. You’ve got to have the right bait and tickle people towards you. You can do that through a video, and through long form posts, and through publisher posts, and through various other features and tools out there but with content your own and other people’s, but you do need to create that kind of interest, and consistency is key to that. Unfortunately, unless you’re using LinkedIn ads, where you’re limited is that you don’t really control who sees it other than your network. You can’t really control who’s going to see that content unless you send them a private message. That’s where things like email marketing are much more powerful because at least you know what they’re getting and when they’re getting it, and you can see your click through, and open rates, and things like that. LinkedIn has some statistics I don’t know how really useful they are. Marylou: I remember that one time I did a post, it was a very simple post that referenced an article, and somebody responded to the article, or to that post on my thread who is very well-known and all the sudden, in a course of a day, it jumped up to 38,000 views and almost 300 likes. Did that impact my world at all, even though it’s all under my name, and people looked at my profile, everything went up, everything went up. Did that impact my day-to-day? Not in the slightest. Viveka: Thank you for bringing that up because there’s some ninja tricks here to help take that to the next level. On LinkedIn, it’s always about the engagement, it’s always about the engagement. First of all, to your point, I had someone really well-known comment and suddenly bam more visibility. It’s a great idea whether you do it through email, or through LinkedIn’s own messaging, private messaging system, or however you want to do it, through Slack, through whatever tool you want to use, but where you get a little community of people to share each other’s content. The more influential they are, the better. We’ve got a little community of people and we share each other’s content, and that does most definitely drive visibility. Another thing that you can do is employ advocacy. If you’ve got a large employee base, if you are in Oracle or whatever, you can use tools like GaggleAmp, or EveryoneSocial, or LinkedIn even has a tool called Elevate that really helps with employee advocacy and helping your employees to promote your visibility, and the visibility of your content because, that’s great, you can pop it on your company page, but depending on how many people follow your company page, that’s pretty much going to limit who sees that content unless you promote it, you pay for it. But, if you’ve got your employees doing it for you, or you’ve got friends, and you’re helping to promote each other’s content, that’s going to get you a lot more visibility, that’s ninja trick number one. People just don’t seem to do it very much on LinkedIn. The other is actually engaging on your engagement. One of the things that I like about LinkedIn and most people, I think they realize you could do it, but don’t do anything with it, is when people like and, or comment on your content, you can just scroll over and see who they are, and immediately message them, or invite them to connect, or if you’re not connected to them, you can certainly publicly respond to them. You can start to build those conversations that way. If you see that a top prospect of yours either through buyer persona, or an actual person that you know, or an actual company that you know, is commenting on your feed, it’s definitely worth engaging. All the great third party apps that used to do that for you have now been decommissioned by LinkedIn as far as I know. Similar to what you do in your blog post, if you’re getting comments on your blog post and one of them is a hot prospect, then you probably want to one follow up with them. You can do that on LinkedIn, too, but it’s a little bit more of a manual process. Marylou: I would equate it to a direct response, opening an email is like the viewing of a post on LinkedIn. It’s cool to see, but it’s not necessarily the cat’s meow. If you get a click through on the targeted outreach direct response, that’s kind of equivalent to someone actually liking your post. If you get a response, a direct response, that’s like the holy grail, that would be like a comment equivalent. Viveka: That’s exactly right, and you know the cool thing is, it’s really frustrating actually, LinkedIn gives you analytics on who’s viewed your profile, I could see which big companies are viewing my profile at any given time, and I can see the titles, and even the locations, but I can’t see the people, but I can see the people who’ve gone the second step and liked it, or the third step and commented on it. That’s really where the magic is. Marylou: Yeah, so if you’re feeling overwhelmed like someone like me who gets a ton of likes on things, I would probably just want to look at the people who—if I’m thinking, “Okay, let me start small and peel the onion.” I would totally want to look at those people who connect with me on a daily basis. I get around 20 connections a day. I love 20 and 30, those two numbers because they seem like a habit stacking point of view, like something I can do like doing one push up versus 30. I can do 30 touches a day manually without breaking my fingers and I could think of customizing it or personalizing it to the point where LinkedIn won’t get upset because I’m actually substituting, I wonder if you do a word count or a parts count, how do they know that you’re cutting and pasting other than just exact match? Viveka: Yeah, I don’t, doing something with the IP, you know more about this than I do. Something with the IP address is probably how they’re tracking a lot of the activity. Having said that, I’m a huge fan of auto text expander. We’re actually designing one of our own for Vengreso, but right now I use the Chrome extension Texter––what a great way to manually, but very easily respond, and I don’t know why I find it even easier to do that than copying and pasting, I mean it’s probably the same amount of clicks. I have four or five slightly different responses to people who’ve invited me to connect say, depending on who they are, and why they’re—it’s like, one is LI reply, one is LI referral, or ref, one is LI thanks, one is LI book, one is LI book camp. I have all of these responses and so I can very easily go through and do those touches whether it’s to people who have invited me the connect, or the people who I’m inviting to connect, or to people who’ve endorsed my profile. I don’t do that anymore, but you still can, and it’s a great way, “Thanks so much for endorsing my profile. I really appreciate it. Let me know what I can do for you and hey, I see that you do blah, blah, blah, let’s talk.” Anything to start that conversation kind of the coffee or the water cooler or the coffee station of LinkedIn, just a place where you can hang out and start a conversation with a prospect. Marylou: The other thing I think it’s invaluable for is movement of people. Because we all get notified, because usually the person updates their profile if they get a promotion, if they move to a new company. Moving to a company may not come as quickly if there is a little bit of not compete thing going on, or they have to let the waters mellow out before they announce that they’re gone. It’s mostly in sales. Those are two areas I watch for all the time, because if my people have moved, then chances are I need to remind them that we had such a great time when they were at this other company. The movement of people I think is a really cool thing about LinkedIn that I know none of my students really take advantage of that. Viveka: It’s huge, and I mentioned Sales Navigator earlier which like I said, big fan. On Sales Navigator, you can actually sort by companies, and who’s just changed jobs within that company, and so there’s a lot of opportunity there. You need to expand beyond your one targeted person because there is so much change over, and there is so much shifting. That’s such a great feature on LinkedIn and most people turn that off in the notifications because they find it annoying, which is crazy. Marylou: That’s one of the best thing to track, firstly for business development where it takes a long time for us to develop relationships because of the nature of where we are sitting in the pipeline. The fact that we’ve taken all this time to develop these relationships, we want to make sure that if they extend beyond the current company, or like you pointed out, within the company building new relationships, it’s going to be a heck of a lot easier to build upon a relationship that you’ve had versus going out cold and trying to find someone who will talk to you. I think those are two other areas for LinkedIn. As we wrap up this session which I can go on for days, this is one of those things where it’s like this piece that’s out there that I know I’m supposed to be thankful for. I’m so much more comfortable being in control of my list, where we’re not really in control in LinkedIn, so just by virtue of that, Marylou Tyler get sort of turned off by the whole aspect. But having said that, if I am starting out and let’s pretend that I’m a sales executive. I prospect not necessarily every day, but I prospect, I close. What are the two or three things, I heard profile is number one. After I get my profile to the point where it’s client facing as opposed to it’s all about me. What’s the next thing I should look at? I know a lot of it is depending on the persona, but let’s pretend I’m trying to do business development, what are the other things, the next two or three things that I can then focus on, and then how long should I anticipate a week of time, is it a daily thing? Is it twice a week? What’s a good rhythm just to get started to maybe generate, I don’t know five to ten new contacts, or new interested people a week? Viveka: The cadence you create is one that you can actually do. Ideally, we have this cadence that we share with our clients, 30 minutes in the morning, 30 minutes in the day, and 30 minutes in the evening, but who is actually going to do that? A busy sales professional probably not. If you’re willing to commit 90 minutes a day to LinkedIn, it’s going to change your business around. However, most people are not. Some of the like at the very least to do this type of things, check your inbox, see if you’ve got any––I call it inbox, now it’s messaging––but check your network and your messaging to see if you’ve got any new leads who are just sitting there, who’ve invited you to connect that you need to respond to. Same thing, check your inbox, and just see if there’s any business waiting for you to respond to it. Well, if you haven’t done it in a couple years, that’s going to take you a while because you probably have over a thousand messages you need to sift through. However, after you’ve done that, it’s probably going to take you a minute or two a day. That’s always good because that goes right into the book an appointment, so that’s very exciting. That should fill you with joy and expectation. Share an article a day, and I don’t care if it’s one that you’ve written for your own blog post, I don’t care if it’s one that your company has written, I don’t care if it’s one that you find on your own timeline that is relevant to LinkedIn, and your audience on LinkedIn, I don’t care if you’re making a comment, or you’re quoting your favorite author, but just one update a day is actually going to vastly increase the visibility of your profile which builds an interest factor. That I would do, check your inbox one or two minutes a day, share an update one or two minutes a day. Now, as far as active prospecting, another thing that people don’t do or they do it badly is, using LinkedIn to get referrals, or to get introductions. In fact, LinkedIn took the introduction tool out of the free account, and put it into Sales Navigator. But again, a lot of people don’t make use of this tool and yet if you were to go to a networking event, or visibility to use LinkedIn this way, if you were to go to a networking event, you could go in, sure, and start introducing yourself to people who don’t know you, but it works a little bit better when you see a friend of yours talking to someone. You want to meet and say, “Hey, how are you doing John? Oh, by the way, I’m Viveka, nice to meet you. I see you’re talking my friend John here. Isn’t he a great guy?” You can do the same type of thing on LinkedIn. I would take a couple of minutes every day to go through LinkedIn to do searches using as advanced a search as you can using LinkedIn free now, finding those good prospects, seeing who you have in common, and asking not just one person, but a couple of people if they’re willing to introduce you to them, and you might have to do it old school, through email, or even through a phone call. God forbid you get on the phone with somebody. Having someone actually, physically introduce you to a prospect is going to be really powerful. So seeing who you have in common, and who those people could be, that’s a great way to spend a couple of minutes of your day every day. Just those few things. Maybe it’s not going to take you more than 15 to 20 minutes a day and it could vastly improve your success on LinkedIn. Of course, if you do have an hour a day, I’ve got a checklist for you. If you don’t, just those few things will make a difference. 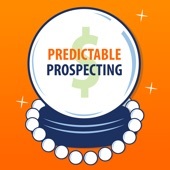 Marylou: Okay so for someone like me who has my prospecting hat on twice a week, I would probably want to spend a little bit more time two days a week, and then the rest of the time, I would do the speedy LinkedIn prospecting version. One article a day to update and share that’s a lot more than I do right now. I’m making my podcast every week, and sometimes on Saturdays I do one. Another thing I’ll put out there for everybody that we like to know in direct outreach and targeted outreach is to start getting a sense of best times, best times to do these things because everyone especially in the social world, there’s a lot more transactions going through. You want to make sure that you track at least for the first month or so, what ebbs and flows in terms of likeability, and views, and things like that so you can get in a rhythm time of day to do the speedy LinkedIn and then also the full prospecting LinkedIn. I found that two very successful to me. Viveka: Tip of the iceberg, yes. Marylou: So where do we go to find more, take classes, I get that checklist you’re talking about, what do we do? Viveka: I’ll send you the checklist and you can just put it in the show notes. Let me do that right now for you. If you go to Vengreso––vengreso.com, we’ve have a blog, we’ve got podcast, so there’s a whole bunch of really useful information on the whole realm of social selling from all five founders of Vengreso. If you want to email me directly, my email is viveka@vengreso.com and any questions you have, I’m more than happy to answer and actually email surprisingly enough is still the best way to get me just because I have almost too much activity on LinkedIn. If you want to connect on LinkedIn, if you just Google LinkedIn Expert, my LinkedIn profile is the first one to show up. Just please customize your invitation because I am at my limit which is 30,000. Just let me know that you heard me on Marylou’s podcast, and I’ll make sure to kick somebody off and put you into my network. Yeah, the email is probably the best way. We’ve got a boot camp that we’re starting in July. Again, we’re literally finishing it up tomorrow, but we’re starting it again in July. We’ve got online learning programs that’s good for the solopreneur, and we can certainly scale it up to enterprise size. We’ve got the information for you if you need it, but for the meantime, any questions that you have, I’m more than happy to answer through email. Marylou: Very good, we very much appreciate your time, and this is going to be one of the more popular podcasts for sure because LinkedIn is still this beast out there. Actually, I think Sales Navigator doesn’t do a fabulous job, I don’t think in educating the base, because I don’t have Sales Navigator and I don’t even know how to use it. Viveka: It’s such a great tool and no one knows how to use it, and that’s not your fault. We’re actually working right now on a training program specifically at LM, Learning Management a downloadable training program just on Sales Navigator because I hear that literally every day. Marylou: They were actually at a booth, I think the show that you and I met at. It’s like, give us a dummy’s guide or a preflight checklist. The checklist manifesto, whatever you want to call it, give it to us, because I can’t even tell you how difficult it is from a user interface to get in there and do anything, at least just for me. I just don’t get it, I’m a programmer. Viveka: Exactly, I’m glad in a way because it means I’ve got a job. If they would have been easy to use, I’d be out of a job. Marylou: I think you’re quite safe. Well thank you so much. Marylou: I very much appreciate you being on the podcast and great success for you guys, I’ll be watching and hopefully see you soon again at another event. Viveka: Thank you so much.